Police officers could take to the streets to protest in a return to the "very bad days of the 1970s", the Police Federation said. The federation's chairman, Paul McKeever, said there could be 20,000 fewer officers in four years as a result of government spending cuts. Shadow home secretary Ed Balls told the House of Commons' home affairs select committee 14,500 job cuts had been cut. He said those which had been announced were the "tip of the iceberg". Mr Balls said 16 of the 43 police forces in England and Wales who were asked had already announced 14,482 jobs would be lost, including 6,257 police officers. In the Spending Review in October, police learned they faced a 20% cut in funding by 2014-15. The Home Office has said police forces had to make "necessary savings". But it said "protecting the front line and prioritising visibility and availability of policing" had to be maintained. Mr McKeever told the committee the cuts could see police take to the streets in protest. "We don't rule anything out at all," he said. He added: "We're expecting to lose at least 20,000 officers over the next three to four years due to the financial situation." He said the number of police officers, per 100,000 of the population, would fall to a level below "the very bad days of the 1970s". Mr McKeever said of the 1970s: "It was in chaos. People were leaving in large numbers. Nobody wanted to stay because pay and remuneration were so poor. "It was that bad that it was compulsory for police officers to work three of their rest days as overtime." He said the ratio was 215 officers per 100,000 in 1976, compared with 257 today. Asked about reports half of police stations could close, he said: "I don't know at the moment. All bets are off at the moment." In December the government announced police forces in England and Wales would face cuts in central funding in the next two years of 4% then 5%. Central funding will fall to £9.3bn in 2011-12, then £8.8bn the following year. Mr Balls said: "The police are taking a much bigger hit than other vital public services. The sheer speed and scale of these cuts - over 20% and with the biggest reductions in the first two years - will hit the front line hard and go way beyond what independent experts believe can be achieved from efficiencies and better procurement. "At a time of rising public protest, an ongoing terror threat, the security challenge of next year's Olympics and an expensive reorganisation of policing, these cuts are a reckless and dangerous gamble. "They will undermine the fight against crime and take unnecessary risks with national security and the safety of our communities," he added. "The government should go back to the drawing board and think again," he concluded. 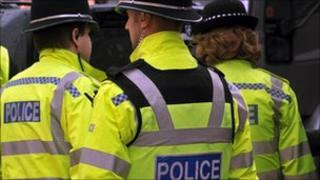 The chief constable of West Midlands Police, Chris Sims, said he expected to lose 1,000 officers and 1,250 civilian staff. He told MPs: "I absolutely believe that we can continue to provide the service and protection that our communities need but in taking out, as I will have to, some 2,250 staff posts, that does mean that the way that that service is presented will necessarily be different." Peter Fahy, chief constable of Greater Manchester Police, said he expected to get rid of 2,800 staff over the next four years, including 1,400 officers. He said: "Stations will close and there will be less discretionary activity by patrol officers, so more of their efforts will be directed against particular problems. "Things like schools-based officers, things like following particular lines of inquiry which we know are probably not going to lead anywhere (will be cut)."